The position of an EMT is a job opportunity for a person who has excellent customer service skills and is a caring and compassionate clinician. Flexible scheduling to work with outside commitments such as school. Medical, Dental, Vision, HSA, 401k, Legal Shield and more! Several promotional opportunities such as FTO, Field Supervisor, Management Training, ect. 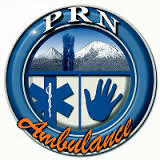 PRN Ambulance will pay for your DOT, DMV H6, DL51, ACLS, PALS, and BLS/CPR up to $150 each upon hire. Walk - frequently, up to 10 hours per day. Run - infrequently, 1-2 minutes per day. Stand - frequently, up to 10 hours per day. Sit - frequently, up to 8 hours per day. Kneel - frequently, 10-15 times per day. Bend - frequently, 10-15 times per day. Must be able to climb stairs while carrying up to 150 Lbs.